For this large-scale project, alabaster is used in many different ways: for the table, the wall, the bar front, the floor outlines and the chandelier. At the heart of the central room and facing the sea, the monumental chandelier is displayed: it is a real weight-defying work of art. 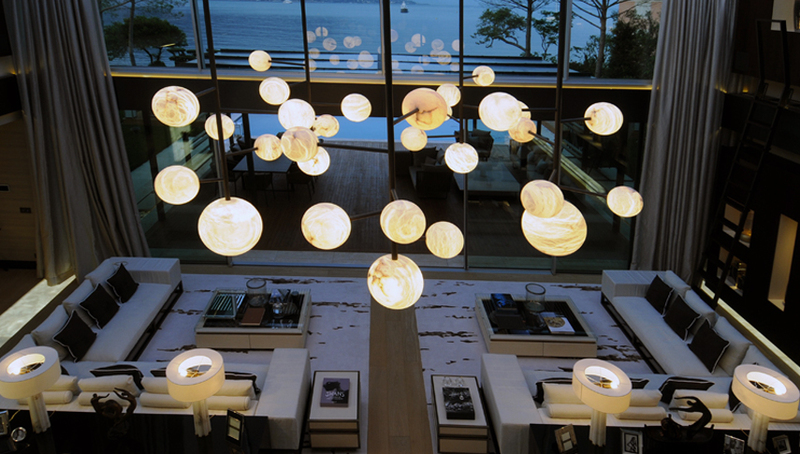 Attached only to the central beam, the tailor-made “Botero” structure holds thirty luminous spheres. Like planets, they light up and seem to dance. When the roof opens up, the alabaster holds conversation with the stars.